Determined to actualize a sovereign state of Biafra, 15 pro-Biafra groups have come together to fast-track the realization of the dream. The new coalition believes that the dream could be a mirage if they continue to pursue it individually. However, there are some other groups who have dissociated themselves form any form of alliance. But the coalition was brokered at the Rojenny Sports Village, Oba, Idemili South Local Government Area of Anambra State when the leader of the Movement for the Actualization of Sovereign State of Biafra (MASSOB), Comrade Uchenna Madu entered into an agreement with 14 other pro-Biafra groups, excluding the Nnamdi Kanu’s Indigenous People of Biafra (IPOB) and Chief Ralph Uwazuruike’s Biafra Independence Movement (BIM) at a seminar with the theme: ‘51 Years After Biafra Declaration, Between Territorial Sovereignty and Cultural Identity’ to carry out an appraisal of the struggle towards actualization of a Biafra nation. The occasion coincided with the day the IPOB declared sit-at-home on May 30. 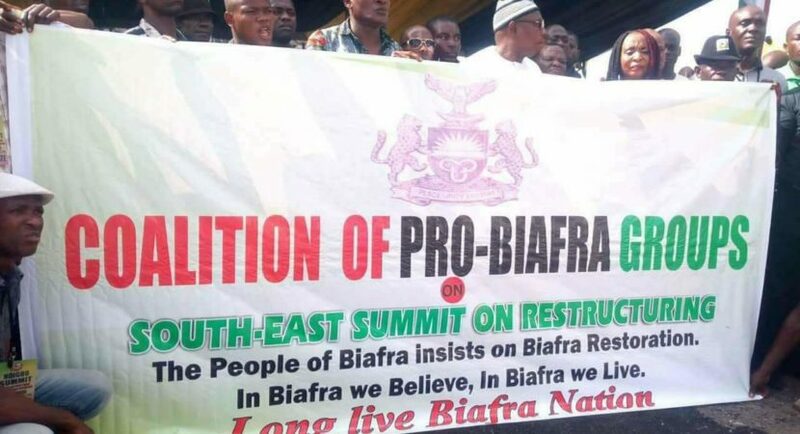 Even when IPOB has not officially joined the 15-group alliance, Comrade Madu acknowledged that May 30 would ever remain remarkable to the Igbo as far as Biafra struggle was concerned. According to him, the seminar was to mark the 51 years anniversary when the late Dim Chukwuemeka Odumegwu Ojukwu declared the Republic of Biafra. Madu posited that the need to jaw jaw on the current approach being employed by different groups had become imperative in the Biafra struggle. He said that the approach must be coordinated for the groups to achieve their goal, which is Biafra actualization, despite their ideological differences. He noted that it would be irrational that different groups fighting for the same goal would be at one another’s throat instead of working and walking together to actualize their aspiration. The MASSOB leader believes that combination of strategies employed by different groups would present a new dimension to the struggle towards the actualization of a Biafra nation. “As a coalition, Biafra is achievable. That era of self-glorification of one person trying singlehandedly achieve Biafra is gone. We may disagree as individual groups due to ideological differences, but we are all working together to achieve Biafra. “Biafra is more than Uchenna Madu, it is more than Nnamdi Kanu and Chief Ralph Uwazuruike, or any other person. All we are working for is to actualize Biafra. We have more than 15 pro-Biafra groups, and our dream is for all of us to come together to work as a team to actualize Biafra,” he said. One of the main architects of Biafra struggle and former President General of Ohaneze Ndigbo, Dr Dozie Ikedife who chaired the seminar appealed to all groups hungry for self-determination for the people of Biafran land through either legal process, diplomatic process, dialogue, consultation, referendum or legislative process to come together and speak with one mind and voice. He noted that infighting among the groups would totally be counter-productive to the cause they are fighting for and that each individual group should play its role to the best of its ability. “It is a matter of concern at the rate we are fighting among ourselves. When self-determination is achieved for our people, it may be very difficult to peacefully organize ourselves; mayhem of immense magnitude may overtake the result. God forbid. “With the situation on ground today, one wonders whether all those who claim to be pursuing self-determination agenda for the people are sincere. If two people believe in one thing and are pursuing the same objective, it is most unexpected that they should be quarreling and abusing each other,” Dr Ikedife reasoned. He revealed that the Supreme Council of the remnants of the elders of the Igbo would be expanded to accommodate more people from wider geographic space. As the Deputy Chairman of the Supreme Council of Elders of Biafra, Ikedife on behalf of the Chairman, Hon Justice Eze Ozobu invited those in Biafran land to make inputs by forwarding names of men or women of integrity for inclusion into the body of Supreme Council of Elders. The Igbo leader called on the Federal Government to reverse without further delay “the wrong labeling of peaceful non-violent unarmed people as terrorists. Let them hang that label on those who truly qualify for that title.